Tech Transfer Teams are trained field agents who offer regular on-site hive inspections and sampling for large commercial beekeepers. The data they collect help provide large-scale beekeepers with the knowledge to make management decisions to maintain healthy colonies. 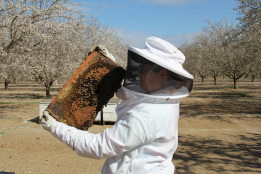 One of the Bee Informed Partnership’s major focuses is to bring together several disciplines to study ways to keep honey bee colonies healthy. One way we try to help all beekeepers is by conducting annual surveys and sharing the results with the beekeeping community. 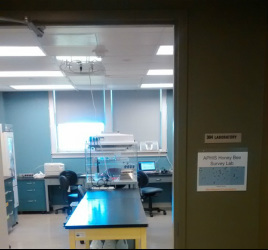 The APHIS (Animal and Plant Health Inspection Service) NHBS is nation wide survey based on testing biological samples for disease, pests, and pesticide analysis. The Sentinel Apiary Project is new initiative being launched out of our lab to serve as an early warning system for apiary health. 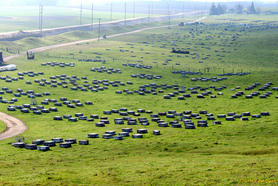 This project involves monitoring multiple attributes of colony health to asses for indicators of stress on the hive. To asses colony health we will monitor the weight of the hive which serves as an indicator of honey flows, dearths, swarming, etc. We will also monitor for Varroa and Nosema disease.